changed hands recently from independent to Shepherd Neame. While this means the food is substantially cheaper, it's now also much lower quality. shame, as this used to be a great destination for Sunday lunch. Not much more than another chain pub now. Often use this pub, and as said below it isnt the cheapest pub around but the food is very good and the beer has allways been fine. The monthly quiz is good fun too. 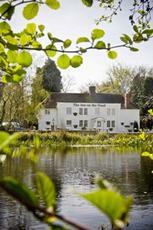 Great location, especially in summer, good beer, ok food, friendly staff. Massively overpriced beer and food and the wine list prices are ridiculous. This does not stop us from going, very nice to walk there from Redhill, in the summer sit in the garden, in the winter by the logburner. If it was cheaper we would go more often. Nice pub with seats outside overlooking the cricket green. Food and beer both good, staff helpful and pleasant. Never been before, but the current 4.7 rating seems unfairly low. 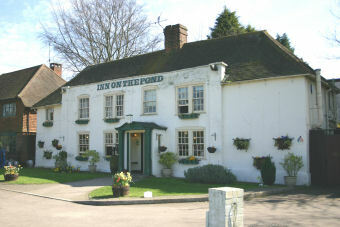 Went to Inn on Pond for first time for Sunday Lunch. Had booked in advance. Staff were welcoming. We were impressed with the standard of decor, which was smarter than I would of expected for a pub restaurant. A good selection of 1st and main courses. The goats cheese souffle was good, but could of done with slightly more seasoning and more cheese for my taste. Also the Thai fish cakes could of been a bit more fishy and spicy, after all it is Thai. Had the Roast Beef. Even though the meal was reasonably warm, but not piping hot, when it arrived, by the time I was half way through it was barely warm. Had to ask for horseradish. I was not impressed with the Yorkshire pudding, which was tiny, not crisp and slightly tough. I'm guessing it was from frozen and then microwaved, which at the price is not acceptable. The beef lacked flavour and was sliced too thin for my taste, and not enough of it. The rest of the vegetables where fine whilst hot. The mixed dessert to share was fun and a nice idea if you are undecided, with mini versions of five of the listed desserts. Given the location and the work that has been put into the interior, the food needs to be raised to a standard to match. I would say it is overpriced and not a pub for a foodie. As far as the overall experience goes, it was ok. Not sure I would return though.